KSYN pronounced Kay-Sin, is no stranger to the stage. She has been modeling for a little over 4 years, and dancing since the age of 5. Born and raised in the Bronx, this bombshell stands at 5′7″, with measurements of 33-27-39, piercing eyes, a radiant smile, and legs to die for, Ksyn has surely begun to climb her way to the top. At the tender age of 5, her mother decided to put her in dance class so she could channel her energy into something fun and constructive. As Ksyn got older she began dancing less and became heavily into sports like basketball, football and running. In an attempt to continue dancing she began to learn different styles of dance like African and Jazz at the age of 10. Ksyn continued her athleticism through high school joining the track and field team, cheer leading and even became a cadet in the girl scouts. To add on to her work load Ksyn began stepping and modeling with a youth group called Teens in Motion (T.I.M.). Ksyn had her foot in the door and instead of continuing on the road of stardom, she decided that she needed to continue her education just in case she would no longer be able to pursue her dreams of dance. In the spring of 2005, Ksyn obtained her B.S. in Arts Management with a concentration in Dance, moved back to New York and proceeded to pick up where she left off. Before long Ksyn was landing gigs like Dance Spirit Magazine, XXL and Hype Hair Magazines to name a few. She has also been featured in some of today’s hottest videos with artists like Usher, Mary J Blige, Ciara , Jeremih, 50 Cent and Beyoncé. After linking up with one of the top dance agencies, Bloc NYC, she has toured/performed with stars like Sean Paul, Beyonce, Ciara, Jeremih, NERD and just finished touring with Beyoncé and Jay Z on the On The Run Tour. You can currently catch Ksyn on the new hit show Lip Sync Battle hosted by LL Cool J on Spike TV. Ksyn has even taken a dab into acting. 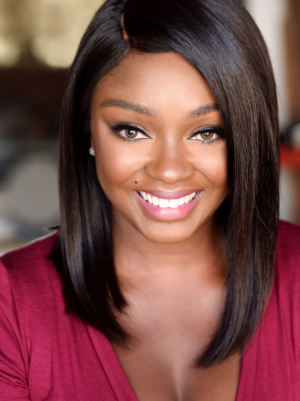 She was featured in a film directed by Dito Montiel, landing the role of Shevonne, along side Channing Tatum, Terrence Howard, Louis Guzman, Brian White and many others and also worked with the director of Training Day, Antoine Fuqua on the film Brooklyn’s Finest starring Ethan Hawke, Don Cheadle and Richard Gere. She has also been featured on the hit show 30 Rock, starring Tina Fey and Tracey Morgan, and How to make it in America, starring Kid Cudi and Victor Rasuk. With Ksyn’s bright smile, down to earth personality, and ever growing talent, Ksyn is one of today’s rising stars and definitely one to watch out for.